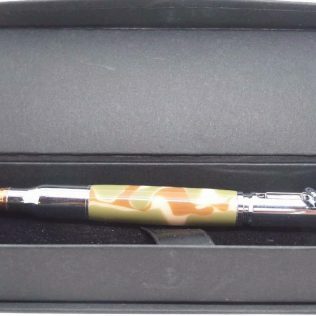 View basket “Desert Camouflage Bolt Action Ballpoint Pen” has been added to your basket. 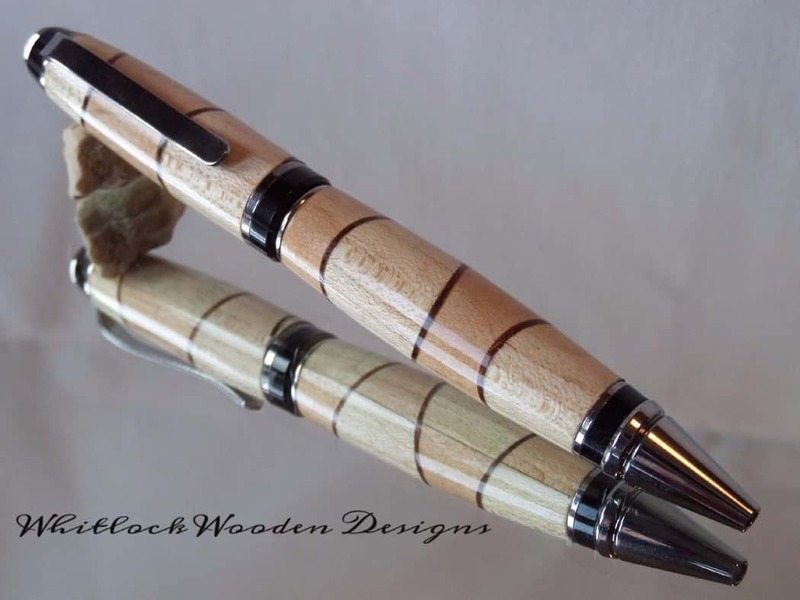 A segmented wood pen with the pen barrels handcrafted in my UK workshops from a special segmented design. 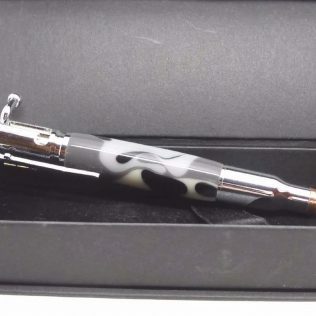 The pens hardware has a high-quality black titanium trim only seen on far more expensive writing implements. 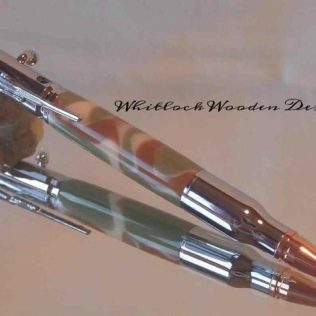 These unusual pens offer endless design possibilities with lots of different patterns and colours. 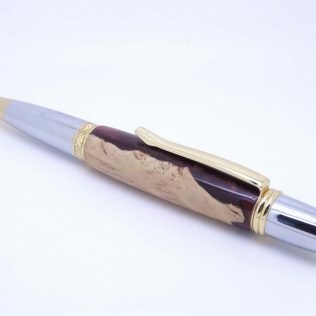 Why not have a look through the shop or gallery for past or current pens. 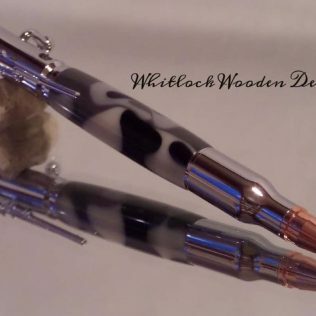 These cigar pens are big and masculine and as such will make ideal handmade Father’s Day or Birthday gifts for men. 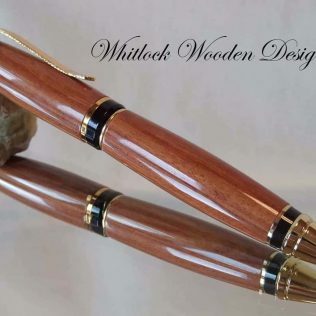 Making wooden pens like this can be fun and addictive, so many possibilities. Once shaped on the lathe it needs sanding through to 400 grit and then up to 8 coatings of ca glue finish applying. This then polished to 12000 using micro mesh for a super hard and durable high gloss finish. The wood needs sealing with a durable finish, not the woodturners traditional friction polish or wax as these are not durable enough for daily use. Sealing the wood will prevent the natural oils from the skin staining and discolouring this beautiful wood. 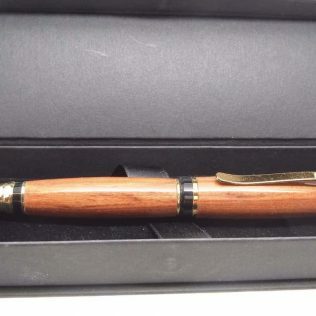 This pen has a double twist mechanism and uses a Parker style G2 medium ballpoint black gel refill available from my pen spares refills or any other good stationery suppliers to keep this beautiful pen in use for many years to come. All my ballpoints come in a black presentation box. 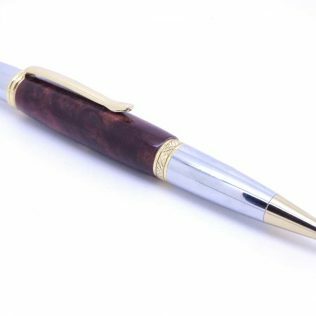 As every piece of wood different in grain and figure even within the same larger piece these hand turned pens will make great wood gifts for men on Father’s Day, Christmas or Birthday gift ideas.